Liverpool’s win over Napoli by the margin they required to reach the Champions League knockout phase leaves their season in perfect shape. Jurgen Klopp’s side are unbeaten at the top of the Premier League after 16 games and now they enter the European territory that suits them best as this tournament now embraces the two-leg format. So how big could this night be as Liverpool’s campaign prepares to move to the next level? If Klopp and Liverpool had plotted a map of their campaign before the season began, to reach this point as Christmas approaches would have been the dream scenario. 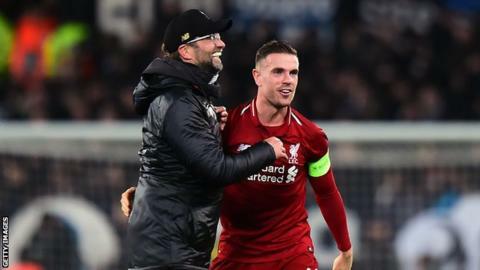 Liverpool have now moved ahead of Premier League champions Manchester City at home and somehow navigated a route which included three away losses – to Napoli, Red Star Belgrade and Paris St-Germain – to advance from a formidable Champions League group. And, to add to the mood of joy around Anfield, Liverpool are now showing signs of the form that made them so irresistible to watch so often last season. Liverpool were, to their huge credit, often grinding out results earlier in the season but in recent times they appear to be moving into top gear. Mohamed Salah is back to the form that made him an instant Anfield superstar last season while in Virgil van Dijk they have one of Europe’s premier defenders, although he will miss Liverpool’s next Champions League game through suspension. These two, in conjunction with outstanding members of Anfield’s undercard such as left-back Andrew Robertson, have got Liverpool’s fans dreaming again on two fronts. It would have been a crushing disappointment had they dropped out of the Champions League – a tournament Liverpool feed off – and into the less rarified air of the Europa League. It would have brought the complication of Thursday night football and, while it offers the opportunity to rest players and is less mentally taxing, it is the Champions League that Liverpool want to occupy. The sense of anti-climax would have been palpable and who knows whether it would have affected their league form? Instead, there is now the growing sense that the force is once more with this Liverpool team. Liverpool and Klopp can now put the Champions League in their back pocket until the New Year and focus their attentions on an increasingly formidable title challenge. Liverpool’s full blast heavy metal harmonies under Jurgen Klopp sometimes hit the wrong note because of a vulnerable defence that undermined their ambitions. It has been an expensive business – £142m to be precise with the acquisition of £75m defender Virgil van Dijk from Southampton in January and the summer addition of £67m Brazil keeper Alisson from Roma in the summer. These deals represent a shrewd re-investment of the same amount they received from Barcelona for Philippe Coutinho last January. Few would have said it at the time but Liverpool sold the man regarded as their best player and have now made themselves a better, more complete team with the cash they brought in. Liverpool’s lapses away from home in the Champions League cannot be ignored and Klopp must put them right ahead of the sudden-death last-16 games – but this pair have given his side an air of steel and calm that has added an extra dimension. Van Dijk, albeit arguably fortunate to escape with only a yellow card for a wild early challenge on Dries Mertens, was immense throughout and was the central figure repelling any rare Napoli threats. The Netherlands captain is Liverpool’s leader, despite Jordan Henderson wearing the armband, encouraging but also delivering the rebuke in moments of carelessness, as he did on occasions here. Liverpool have had 12 clean sheets this season and this was the most vital of all. One goal conceded here could have ripped the rug from under them. And Alisson, deep into four minutes of stoppage team, allowed them to secure it with a vital block from Arkadiusz Milik. Klopp cured one major flaw with Van Dijk’s arrival and an even bigger one with the signing of Alisson, a failing that played a huge part in Liverpool not claiming the Champions League crown last season because of Loris Karius’ calamity in the final against Real Madrid. And now they are fully firing on two big fronts. Liverpool and Tottenham both had questions to answer in this last round of Champions League fixtures after making life difficult for themselves. Jurgen Klopp and Mauricio Pochettino indulged in brinksmanship but have emerged on the other side. Spurs looked in even bigger peril than Liverpool after squandering winning positions when losing away to Inter Milan and drawing with PSV Eindhoven. And yet they have pulled it around with late victories against PSV and Inter at Wembley then completing a remarkable recovery by matching the Italians’ result in getting a draw in Barcelona. Barcelona may have left Lionel Messi out of their starting line-up but to deliver under pressure against PSV and Inter, and the way they did in the Nou Camp, is a huge testimony to the work Pochettino has done. And with Spurs third in the Premier League, only six points behind Liverpool, Pochettino and his players can also justifiably claim they are right in the mix in both competitions. It could have been just two Premier League teams in the last 16 of the Champions League. Liverpool and Spurs have turned their campaigns around and it is now an English full house for the next stage.